A diamond may be forever, but the people who wear them are a lot more dynamic and a lot more changeable. The nice thing about jewelry is that is lasting and durable, which is why it’s so much a part of marriage customs the world over. But people change literally on a daily basis, not only in personality but in physical dimensions. Day-to-day changes may be minute, but over time they can add up to a situation requiring an adjustment to those very durable objects. There may be a long period of time between the moment you pop the question and the moment you say, “I do” – perhaps a year or more depending on your circumstances. A year might not seem like a lot of time, and it may feel like it’s passing by swiftly, but a lot can happen to a body in a year. As such, your finger may get bigger or smaller. If it’s a small change, resizing your ring is certainly an option. For situations where your finger has gotten bigger, metal can be added to the ring to widen it. If your finger has become smaller, a segment will need to be cut out and the ring collapsed. It’s important to note that particularly radical changes to the size of your finger may make it a practical impossibility to resize the ring. The beautiful thing about wearing a wedding ring is that it symbolizes your commitment to your spouse. However, much like marriage itself, the day-to-day wearing of the ring may get a little rough at times. Unexpected impacts against buildings or hard objects, incidental contact with food or other substances, and even ordinary contact with the skin can all potentially cause minor amounts of damage over time to a wedding ring. For obvious incidents like the ring impacting against an object, it’s a good idea to bring the ring in to the jeweler and have them check to make sure any stone settings are still in good shape and that no stones have gotten loose. Periodic cleaning of the ring can help bring the ring’s finish back to its original luster and prevent deterioration of the settings. Dominion Jewelers wants to make sure that any piece you purchase from us remains beautiful for a long time. 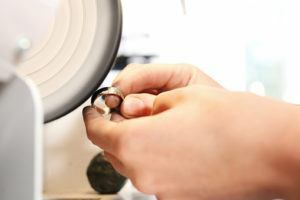 Contact us when you need to make your rings shine again or to have them resized as needed.